Owned by the Cleveland Clinic Foundation (CCF), the Cleveland Clinic is an academic hospital located in Cleveland, Ohio that includes a wide range of medical specialties, all led by experts in their fields. There CCF also runs the Cleveland Clinics in Florida and Nevada, as well as those in Canada and Abu Dhabi. If you are seeking employment with one of the top medical hospitals in the country, then submit your Cleveland Clinic application for the experience of a lifetime. The standard opening hours at the Cleveland Clinic are 8:00 A.M. to 5:00 P.M. from Monday to Friday, but the clinic includes an extended hours and weekends policy for acute medical conditions. If you have an acute issue, then you don’t need an appointment. All you have to do is come in and the Cleveland Clinic medical specialists will provide you with the highest standard of care. If you wish to make an appointment, you can get one online on the official website or you can call 877.463.2010. 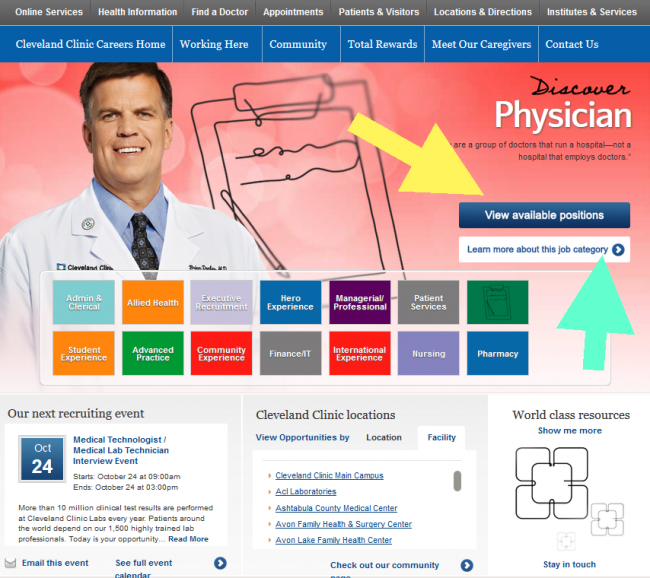 You can find all the information you need about the Cleveland Clinic on their official website. You can request an appointment or you can find the perfect doctor suited for your medical needs and even personality. The Cleveland Clinic in Cleveland, Ohio is located at 9500 Euclid Avenue, Cleveland, Ohio 44195 United States. You can find the exact address for the rest of the Cleveland Clinic locations in Cleveland, Florida and Nevada on the clinic’s official website. As a medical hospital, the vast majority of Cleveland Clinics careers are suited for highly trained professionals, who need to have at least a college degree. As such, the minimum age for employment is 21, which is the minimum age for college graduates. However, there are several maintenance Cleveland Clinic jobs that do not require that applicants have a college degree, as well as Cleveland Clinic jobs for students in the call center and reception department, that also have a lower age limit, which usually is 18. Explore the Cleveland Clinic Careers page and submit your Cleveland Clinic application to the positions that fit your professional training and education. 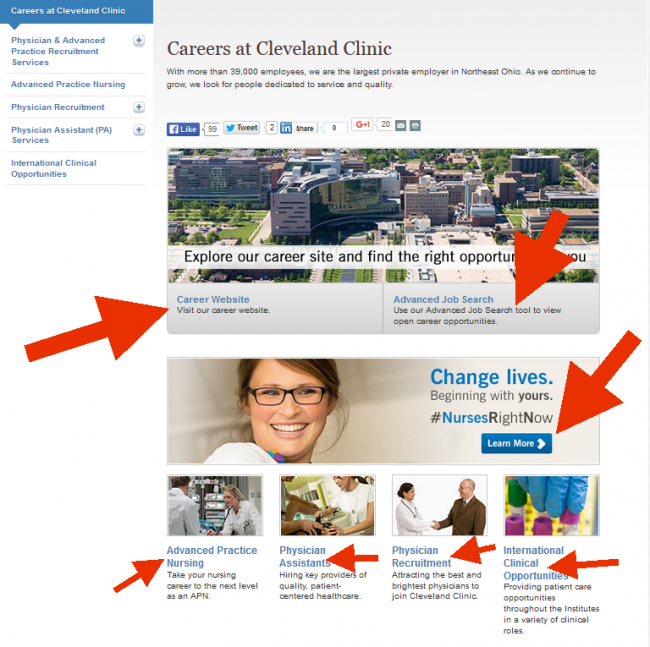 You can use the Cleveland Clinic Job Search menu to find all the jobs you want to apply to. The first step of the Cleveland Clinic application process is accessing the Cleveland Clinic Careers page. To do this, you can either go directly to clevelandclinic.jobs, which is the Cleveland Clinic job application portal or you can go to the official website and click on the Cleveland Clinic Careers button. 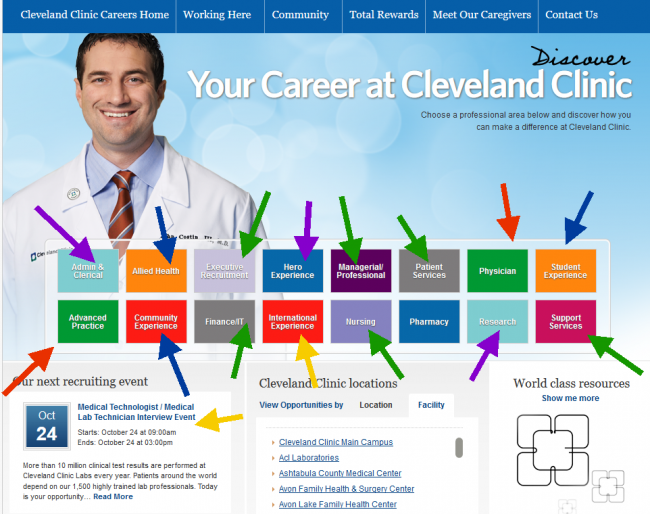 You will be redirected to the main careers page, where you will find information about Cleveland Clinic employment. Click on the Careers Website button to be redirected to the Cleveland Clinic job application portal or click on the Learn More to get more information about the Cleveland Clinic jobs in the Nursing Department. On the Cleveland Clinic job application portal, you can choose you preferred department and then search for the available positions with the company. Click on the View available positions button to see a full list of all the Cleveland Clinic jobs in your chosen department. Also, click on the Learn more about this job category button to find out more about the department. Take your time to read the job descriptions for all of the Cleveland Clinics jobs you think you are qualified for, and if you are certain that you want to apply, click on the Apply Now button to begin the Cleveland Clinic application process. Download the How to apply pdf file to get more information about the Cleveland Clinic application process. You will be presented every step required for filling out the Cleveland Clinic application and if you are in need of technical assistance, you can get in touch with the Talent Acquisition general line by calling at 216.448.0377 from Monday to Friday, 8:00 A.M. to 4:00 P.M.
A printable Cleveland Clinic Jobs and Employment Form is not available, so you will have to submit your application online through the Cleveland Clinic employee portal. There are Cleveland Clinic Careers available in all of the company’s departments. Browse the available positions list, as well as the Cleveland Clinic application status of each job, and then submit your Cleveland Clinic application via the job application portal. Remember that there are both Clinic-based and Office-based jobs at Cleveland Clinic, so take your time with the openings list. 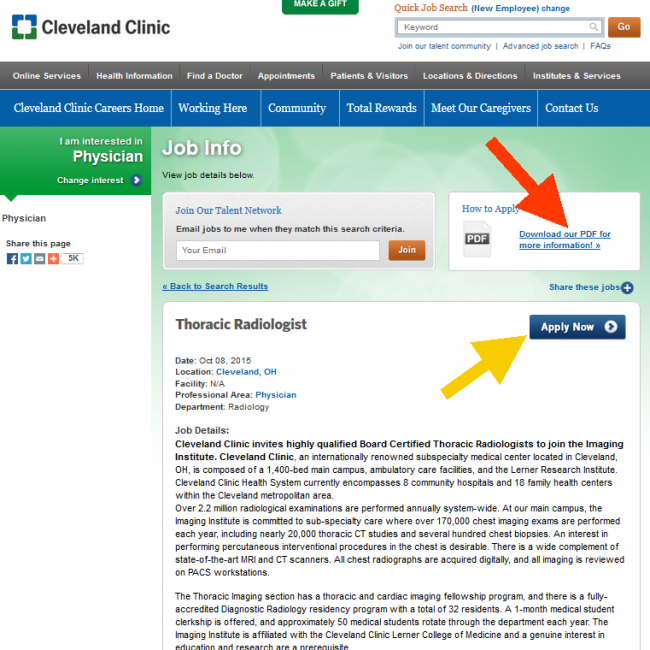 At the moment there are 57 Cleveland Clinic job opportunities in the Pharmacy Department. Browse the list and submit your Cleveland Clinic application to those that you are eligible for. The Cleveland Clinic pharmacist will have full control over the medication that makes its way to the patients. He/ She will have to analyze every prescription and then identify every drug related issue that might have been made and provide a solution to the problem. He/ She will have to fill the prescriptions with the medical products in the pharmacy and report everything in the digital system. The Pharmacist will also have to provide accurate drug education for the medical staff, so that the patient receives the best possible care at the Cleveland Clinic. The annual salary for this Cleveland Clinic career averages at $120,000 per year and is completed by a set of bonuses, according to the performance of the employee. At the moment, there are 498 Cleveland Clinic nursing jobs available with the company, so browse the Cleveland Clinic job openings list to see all the opportunities out there. A Cleveland Clinic nurse provides direct patient care for the patients in his/ her ward that he/ she is assigned to. These patients might present a wide range of medical conditions, but the RN is expected to know how to provide the best possible care for the patient. The base salary for this Cleveland Clinic job starts out at $24 per hour and can get as high as $32 per hour, which means that the annual rate varies between $46,000 and $75,000, along with bonuses. There is also a comprehensive benefit pack that comes with Cleveland Clinic Nursing jobs that is well worth your attention, as it includes a solid Cleveland Clinic employee health plan and several Cleveland Clinic employee discounts. At the moment, there are 197 Cleveland Clinic job opportunities for Physicians, including International Cleveland Clinic Abu Dhabi jobs. Cleveland Clinic’s Emergency Services Institute is constructing a team of specialists for its Academic Affiliated Pediatric Emergency Departments. A Cleveland Clinic Pediatrician will provide world class care for all the patients who come in and will work alongside nurses, pharmacists and the rest of the team’s members in order to care for the patients. All candidates are required to have (or to obtain) a ATLS/ PALS Certification and to have extensive experience in the Emergency Department. According to the physician’s experience and qualification, the salary for this Cleveland Clinic career may vary between $137,000 and $190,000 annually. There is also a comprehensive Cleveland Clinic employee medical plan, as well as a series of impressive Cleveland Clinic employee benefits for all Physician positions in the company. At the moment there are 194 Cleveland Clinic job openings in the Managerial/ Professional Department, so read the list attentively and submit a Cleveland Clinic job application to the ones that are in line with your education and qualifications. The Nurse Manager will coordinate the entire nursing department that he/ she is assigned to. This entails overseeing the performances of the nurses in the department and providing assistance and guidance to the nursing staff when necessary. He/ She will also be in charge of developing the budget for the nursing department, and will conduct regular monitoring to make sure that the department is running in line with the highest standards. The main aim of the Nurse Manager is to coordinate the entire department, so that the patients receive the best possible care at all times. Therefore, the Nurse Manager will permanently monitor the performance of the employees in her unit. He/ She will be in charge of the hiring process, as well as terminations, so that the department is represented by highly trained professionals at all times. Unfortunately, the salary for this Cleveland Clinic career has not been disclosed, as it is determined according to the skills and experience of the candidates. There are quite a few Cleveland Clinic employee benefits that the company provides for all Cleveland Clinic jobs. And while the specific benefit pack may differ from one Cleveland Clinic career to another, the core benefits included in the standard pack are meant to provide the employee with excellent coverage. Consult the Cleveland Clinic job opportunities list thoroughly and take tour time to see what each of the job entails. 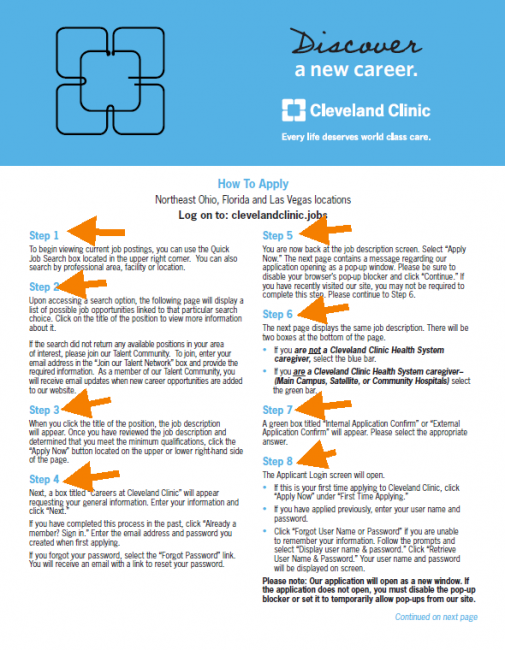 To make sure that you are following the Cleveland Clinic application process accordingly, download the How to apply pdf available with every one of the positions and read it step by step as you go through the Cleveland Clinic application process. You will have to provide information about your professional background, along with references and about your previous work experience, again accompanied by references. Make sure that you provide the correct contact information for the people you list in your references, because the Human Resources department always corroborates the information you include in your Cleveland Clinic application. It will prove to be helpful if you keep your resume close by, because you need to include the full name of the university (ies) that you have studied at, along with the full name of the programs and complete contact information, as well as extended information about the companies that you have previously worked for. Make sure you have enough time to fill out your Cleveland Clinic application, as any interruptions might lead to mistakes. In the event that you experience technical difficulties with the Cleveland Clinic employee portal, make sure that you have the number for the tech help line (216.448.0377) saved in your phone or on a post it, because you need to be able to reach them. Something so small as tech bug shouldn’t be what is keeping you from your Cleveland Clinic job. Always double check the information you put into your Cleveland Clinic application, because any spelling or grammar mistake might make you stand out in an undesirable way. Your Cleveland Clinic application will be assessed by the company’s hiring specialists and if your qualifications, professional training and experience are in line with the company’s expectations, then you will be contacted to schedule an interview. The interview process differed among the many Cleveland Clinic careers, and while some entry level positions have a single-interview policy, most Cleveland Clinic jobs entail more than one interview in the hiring process, because the candidate needs to be assessed alone first and then cross-analyzed with the rest of the employees, so that the best possible candidates are chosen for the positions. In order to prepare for the Cleveland Clinic job interview, you need to conduct your personal research about the company. Read about their best departments and their professional breakthroughs, because this will prove to the interviewers that you are dedicated. Make sure you are ready for any professional questions that they might have for you. As a highly trained professional, you are expected to be up to date with the latest technologies in your field of expertise. However, this is not something you will be able to do last minute. In order to feel more relaxed before the Cleveland Clinic job interview, choose the best possible attire for the occasion. 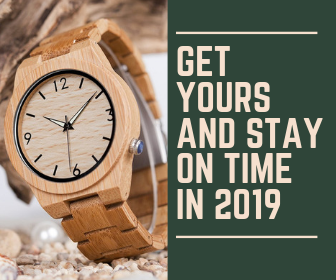 While you do need to adjust your look according to the position you are applying for, there is not much room for casual when it comes to a state of the art Academic Hospital like the Cleveland Clinic. Opt for a business look and make it business formal for higher level Cleveland Clinic office careers as well as Clinic-based careers, and go for something less formal and just the right amount of casual for entry level or lower level positions. Your overall look needs to be extremely poised. Also, pay special attention to personal hygiene, because any mistakes related to this might weigh heavily in your interview process. Furthermore, something subtle like a perfect manicure might make the interviewer remember you in a good light. Such an important detail might even be strong enough to set you apart from the other candidates. As the entire interview process varies greatly among the numerous Cleveland Clinic careers, the interview questions are extremely different as well. Why do you want to work for the Cleveland Clinic? Do you know what the Cleveland Clinic core values are? Remember to provide interview answers for these introductory questions that are focused on the research you have conducted prior to the meeting. For instance, you can use the clinic’s biggest medical achievements as arguments for wanting to work there. Furthermore, you can prepare a set of questions regarding the Cleveland Clinic that you can ask the interviewer at this point, in order to establish your interest in the company. The, the interview will most likely focus on professional questions, because the interviewers will want to get to know you better and to see if you are a good fit for the Cleveland Clinic team.